This page is continuously being added to and revised when possible. If you have a local breaking fire news story (region 6 area), or beneficial fire/forestry related element that you think should be on here, please send your news or suggestion to info@peakforestry.com - We welcome and value your input into how we can better serve you with our organization. "Limb your trees 10 feet from the ground"
Let's talk politics. We as the civilians must start talking about these politics soon, because silence and division will solve NOTHING. Those who control your tax dollars; they want us silent and divided. If we are going to fix some of the critical problems in this nation, such as wildfire defense, we MUST end the division and start talking about things that might make us uncomfortable- such as politics. It's not as simple as clearing ten feet up the trees and taking a few bushes out here or there. Take a look at the videos from the recent fires in California. Most of the trees in those neighborhoods actually were limbed up; No kidding. In fact, for many areas only the ground or structures burned while the canopy of the trees and some vegetation remained. Houses were built to code and they still ignited. There were lawns cut as short as they could be, and they still ignited. It was just the right conditions to overcome our conventional current fire/fuel mitigation measures. We now live in an era with fire conditions that we're not used to historically, so our traditional protocols for fire safety need to be updated. In the area of Paradise CA, short-cut & well manicured lawns (bone dry), still ignited. This was due to drought induced water use restrictions/prices mixed with the high winds, dry RH, and exponentially growing dead fuel loading conditions in that area. We have the exact same set-up just waiting to happen in many of our Oregon communities. This was a rare event for Paradise, but it's nearly happened before; just as recently as 2008. I was there, and we saved many of the homes that are now gone. The 2008 fire while intense, was nothing compared to this one. The problem this time? The forest (public and private lands) outside of the city, was left improperly managed. The fire got established several miles outside of the city. By the time it got to Paradise (very quickly), it was spotting out (throwing fire) 3 miles in front if it due to the voracious intensity; on improperly managed urban interface areas just outside of the city. By the time the fire hit the fuel breaks on the edges of town, thousands of firebrands were simultaneously starting thousands of spot fires as they were raining down on the drought stricken community of Paradise. This community had a program which kept many of the trees in the community 'limbed up 10 feet from the ground' and thinned out with vegetation kept away from most houses. People in this community were very "firewise"... But most houses burned anyways. Believe it or not, Paradise and Redding CA had actually taken many steps utilizing programs similar to the firewise program in Central Oregon. Paradise had been through it before and they thought they were prepared by raking their needles, thinning and limbing the trees, and planting minimal plants around their structures. They even did some limited prescribed burning around the community; just like the fire prevention and fuels management measures in Oregon. The fire protection in Paradise reminds me a lot of the areas around central Oregon- Sisters, Sunriver, DRW, La Pine, and a few more.. You know.. "We want to keep our tree's, but we'll limb them up and be safe, right?" Let Paradise and Redding California be the judge of that. Solution: Larger urban interface zoning. The urban interface is getting larger, especially when fires like these can't be slowed down by our current fuels treatment methodology. We must hold agency and land owners responsible/accountable for fuels maintenance and management on their respective lands. The forest service is under-funded and over-burdened. With the insignificant amount of funding congress allocates to our public land agencies, our forests will never come close to receiving the treatment they need to be safe from unstoppable wildfires, prolific diseases, and the pathogenicity of invasive plant species will continue into epidemic levels. If we as a collective nation wanted to; in ten years we could have our forests to a more ecologically healthy, safe, and productive state for all interest groups. We could actually do that, but more of us need to realize and implement the solutions that will create more success in forest management. We MUST allocate $50 billion a year for the next ten years, and dedicate a program similar to the Civilian Conservation Corps that would get the massive fuels reduction task done. After the ten years, we'd continue to allocate a minimum of $20 billion a year for continued forest maintenance. This isn't a one treatment deal; it's forever, constant, and large scale. Think about the jobs that will be created with the money evenly distributed among a labor force that would spend the money right here- in America. What a concept; don't you agree? Example A- 'The bill sets aside more than $20 billion over 10 years to allow the Forest Service and other federal agencies end a practice of raiding non-fire-related accounts to pay for wildfire costs, which approached $3 billion last year' - So that's $20 billion in funding, for ten years. Example B- '(NDAA 2019) is a United States federal law which specifies the budget, expenditures and policies of the U.S. Department of Defense (DOD) for fiscal year 2019. President Donald J. Trump signed the $717 billion Fiscal 2019 National Defense Authorization Act' - That's $717 billion for one year. We have hundreds of citizens and dozens of firefighting personnel dying each year in our homeland due to improperly managed and underfunded forests. Our communities right here at home are being reduced to ash and rubble- reminiscent of scenes from 9/11 or Pearl Harbor. There is real life death and destruction to communities right here at home. We haven't been attacked by a true foreign nation since Pearl Harbor, over 75 years ago. Yet all of that $717B (annually and growing each year) goes to war and "defense" funds. We need to defend our homeland, first. As a people who just forfeit our money in taxes out of fear of imprisonment, we generally feel powerless and voiceless to where those funds are spent; That is the KEY problem that must be fixed first. We are not voiceless- do not forget that. Most of us are just uncomfortable using our voices loudly. What those of us who are willing to speak up should be telling everyone else is: "Each year our communities are fighting losing battles in the war against fuels management due to under-funded forest management. Hundreds of our citizens are dying each year in our country because of it. We MUST spend more of our 'defense' funds defending our country by reducing the forest fuels and preventing catastrophic wildfires. More of defense funds need to go where they can actually save lives, property, and help protect our county's citizens and homes; rather than in foreign involvement and agenda. We can't seem to win those "wars" anymore anyways, so really, and I mean honestly; what's the point? Do you want to restore forest health? Do you want to help save lives? Do you want to see more of our tax dollars spend on USA soil? Write your congressman. Tell them to put some of us thirty-thousand laid off seasonal wildland firefighters to work each winter thinning and burning our forests properly. Fuels need to be cleared in the forest, fire needs to be re-applied as all forests ecosystems depend on it, and seasonal firefighters (and others) would love the full time year round employment; believe me! For landowners and insurance companies, there are solutions- If you own that 10, 20, 50, or 80 acre parcel between the housing communities where people live and the over-loaded beetle-killed forest on the other side, then it's important to be a responsible manager of that urban interface zone, and keep the fuels professionally maintained on that property- including the grasses. If you or someone you know ever needs help with that, you can always check out professional forestry services like right here at Peak Forestry by visiting the services page. Below are pictures of the Klondike Fire from the evening of 10/14/2018. Copyright 2018- peakforestry.com - Please do not use without permission. Visible Satellite Image from 08/12/2018 showing north-central Oregon. Note the large scale burn scars visible from space. I've put an arrow (13 of them) to help separate individual fires, as many have burned together. For reference, the river at the top is the Columbia River, the green mountains at lower right are the Ochoco Mountains, and the green farm lands above that is Umatilla area. Heat signature on Infrared Ch. 2 (fog) w/ Fire Enhancement satellite image from Klondike / Taylor Fires in SW Oregon on Firday August 10th, around 5 pm. Several other fires are visible as well, including the Carr Fire still burning near Redding California. Each year, thousands of of wildland firefighters like myself choose to put their lives and families on hold to battle wildfires across the continent. Many of us have other jobs, hobbies, and lifestyles that we choose to abandon for the summer months in order to serve our duty as on call firefighters. We never know when that call is going to come in, but we are always ready for it. We do it because we love the job. Our families have to put their lives on hold too. Us firefighters tell our families that we must stay close to the phone and be ready at a moments notice. “Sorry sweetie, can't go camping! There's no cell phone signal out there and I have to be ready to go..” he tells his daughter. Our families support us because they know it's a job we love and is a service that is needed. As wildland firefighters, our greatest support comes from the love, compassion, and understanding that we receive from our family and friends. It means a lot to us knowing that we are appreciated. The thanks we get does go a long way and for that, we in turn thank you; our family and friends. Without your support, we could not do this job. Two more firefighters were killed yesterday. Two more firefighters' families are devastated today. When tragedy like this strikes the wildland firefighting community, the sense of loss reverberates throughout all families and firefighters who make the sacrifice every summer. What can be even worse, is that many seasonal wildland firefighters don't have any type of life insurance policy or pension, or anything that the surviving family can receive to help with the financial burden of losing a dad or mom, son or daughter. This has been a problem for seasonal employees in the wildland firefighting industry since the beginning of time. There is, however, an organization called the “Wildland Firefighter Foundation” that was set up to address this problem. It is a solid, non-profit organization that helps with supporting the costs associated with firefighter deaths in the wildland community. Please donate, even if it's just a dollar. Many of us firefighters make up the majority of donations this organization receives because most people outside of the fire community don't know about it. But now you do. Please share this with your friends and help the families out with your support and donations. It's our families that make the greatest sacrifice every summer, wishing dad was home grilling steaks on 4th of July, or wishing mom was at that camping trip in August. The Wildland Firefighter Foundation helps the families out when someone doesn't make it home from the fireline. Please help, please share. To our families who ultimately make the greatest sacrifice by having to put your lives on hold every summer- we love you and are so grateful for your love and support; Thank you. The ERC: Energy release component. The energy release component (ERC) is a number related to the available energy (BTU) per unit area (square foot) within the flaming front at the head of a fire. Daily variations in ERC are due to changes in moisture content of the various fuels present, both live and dead. 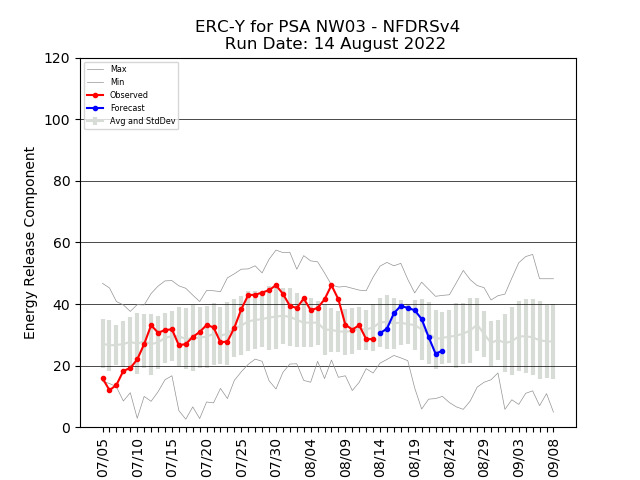 ERC Graph for Central Oregon showing ten day trend (blue) into historical maximum ERC values. 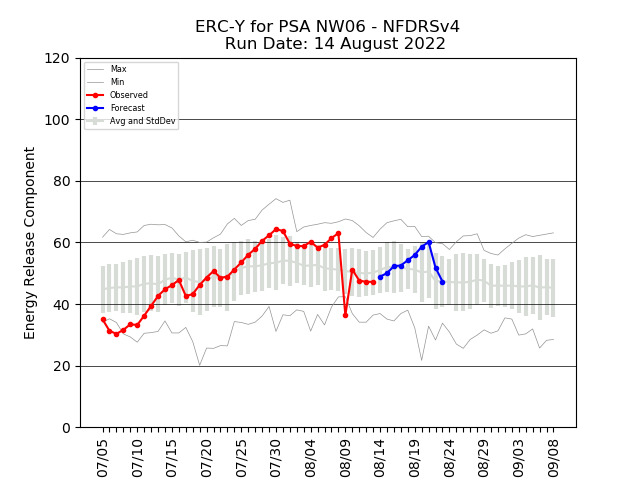 ERC Graph for Western Oregon showing ten day trend (blue) into historical maximum ERC values. 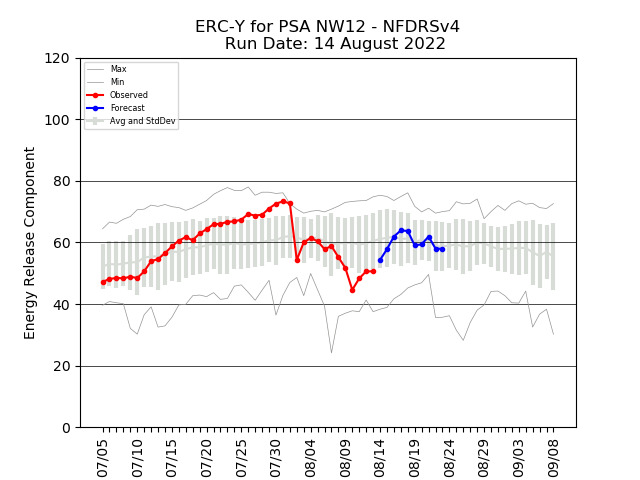 ERC Graph for South East Oregon showing ten day trend (blue) into historical maximum ERC values. Fuel moisture: is a measure of the amount of water in a fuel (vegetation) available to a fire, and is expressed as a percent of the dry weight of that specific fuel. For example, if a fuel were totally dry, the fuel moisture content would be zero percent. 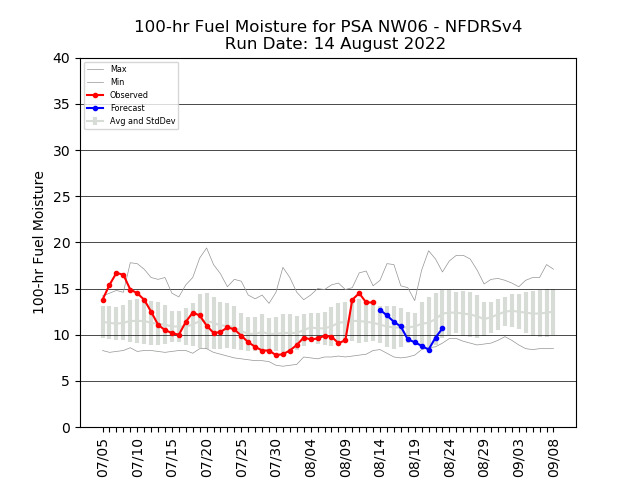 100 hour fuel moisture graph for Central Oregon showing ten day trend (blue) into historical minimum fuel moisture percentiles. 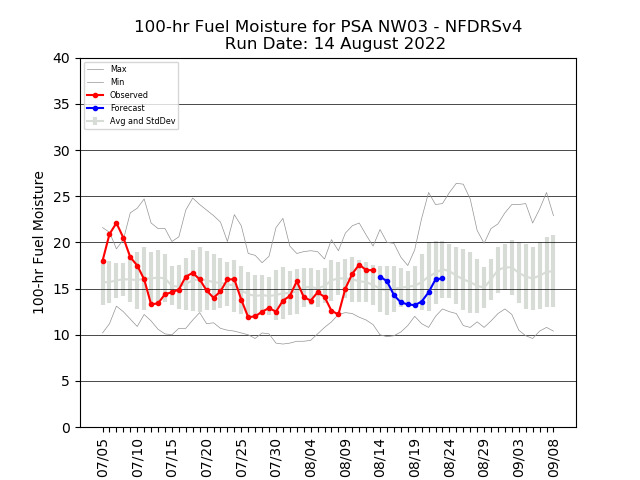 100 hour fuel moisture graph for Western Oregon showing ten day trend (blue) into historical minimum fuel moisture percentiles. 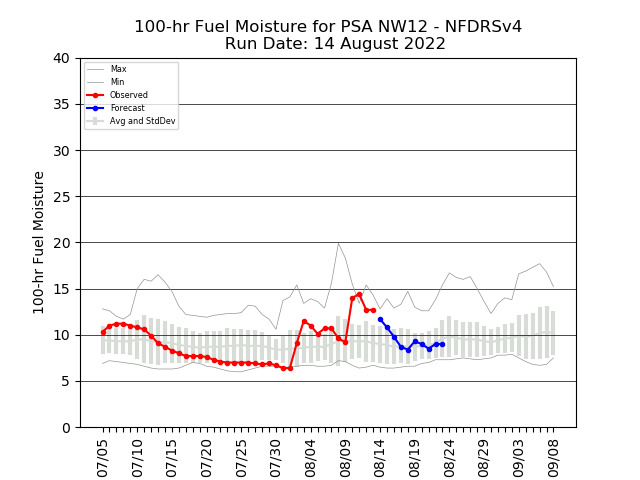 100 hour fuel moisture graph for South East Oregon showing ten day trend (blue) into historical minimum fuel moisture percentiles. Lobster Creek Fire Breaks out 12 miles NE of Gold Beach Oregon in Heavy Logging Slash and Timber. Began 07/01/18 and as of 07/03/2018 is already at 446 acres. "In a globalized world, one application can spread like wildfire and there's only one winning company, which means you have to invest more than you've ever had." "It is known that wildfires behave unpredictably - this is fundamental - but it is my experience that humans in the presence of wildfire are also likely to behave in aberrant and unpredictable ways." "Ultimately, leadership is not about glorious crowning acts. It's about keeping your team focused on a goal and motivated to do their best to achieve it, especially when the stakes are high and the consequences really matter. It is about laying the groundwork for others' success, and then standing back and letting them shine."